What is it about January that makes us all want to dive into the dark depths of clutter in our homes? I can tell you, that for me, January is a time for renewal and repurposing and just getting rid of whatever I can get my hands on. The accumulation over the holidays makes we want to clean, organize, purge and throw, or give so many things away. That being said, even though I always have the best intentions – I don’t always get around to doing it. 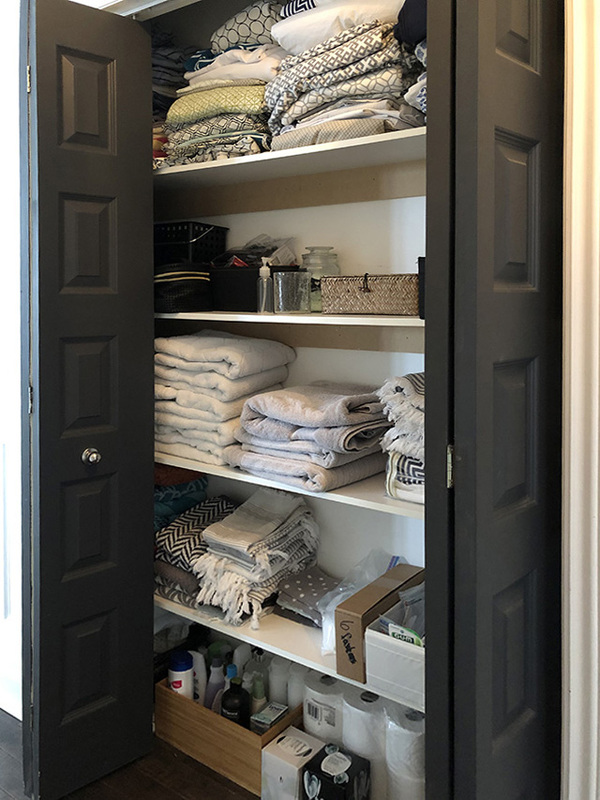 I’ve decided that I’ve had enough of the clutter – specifically in our kitchen drawers and our linen closet. 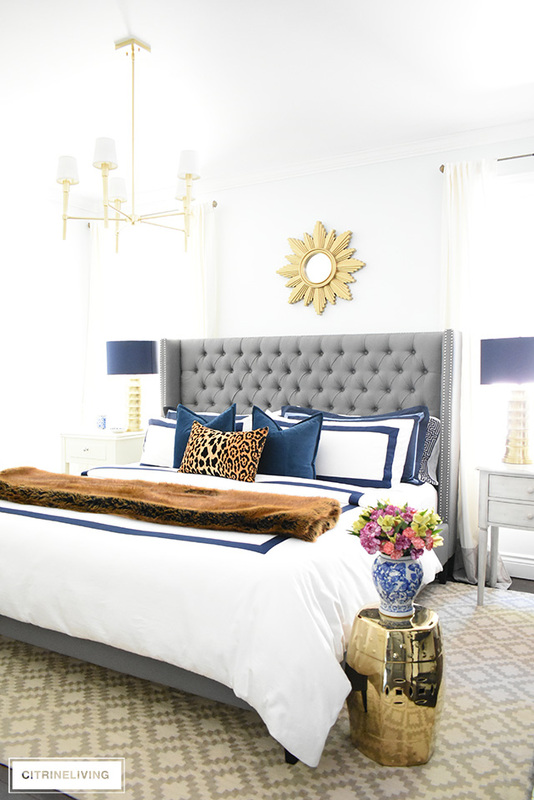 I’m using simple solutions that are affordable and easy to execute, because well, I don’t want to spend a ton and I don’t have to a ton of time. We don’t have a very large home, and our storage is quite limited, so I need to make sure it functions as practically and efficiently as possible. 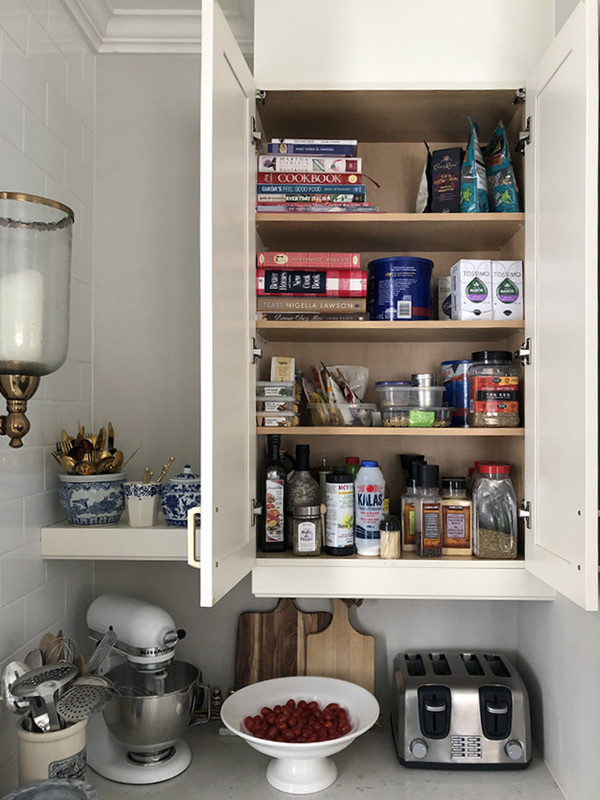 I like quick, easy and affordable – if you remember our $300 pantry makeover from last January, that was exactly how I approached it and it was life-changing – click here to see it. 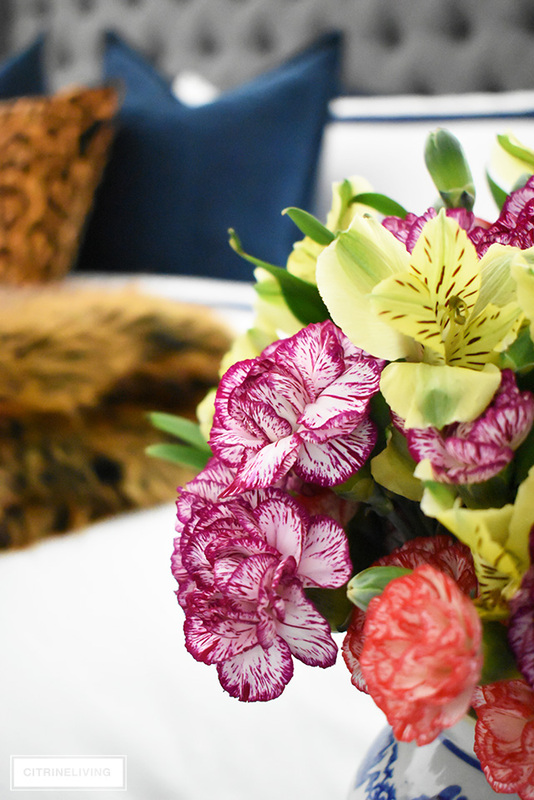 Keep reading below to see my winter organizing projects, and how I plan to tackle them. I think it may make you want to jump into some of yours too! Beauty is in the eye of the beholder, right? Well, not when it comes to my kitchen drawers. The smaller, upper four drawers that flank our stove to be exact. Well, actually three, one of them holds plastic wrap and aluminum foil, snack bags and such…it’s in pretty good shape as is, thankfully. These drawers house all of my small kitchen items, from measuring spoons and cups, to cooking knives, cookie cutters to my handheld mixer. These drawers are a sad, pathetic mess and every time I open them, I get stressed. 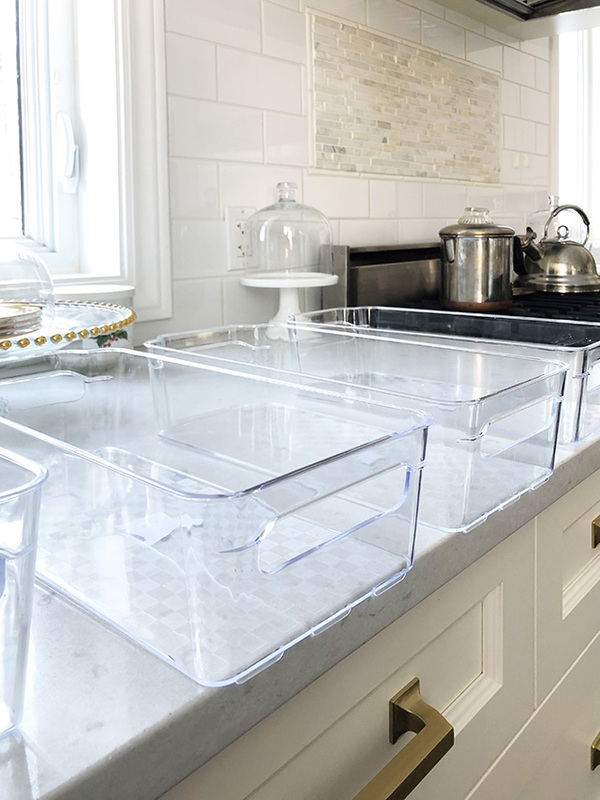 I’ve decided I am tackling the clutter with the most basic organizing solution out there – clear plastic bins to contain the mess. 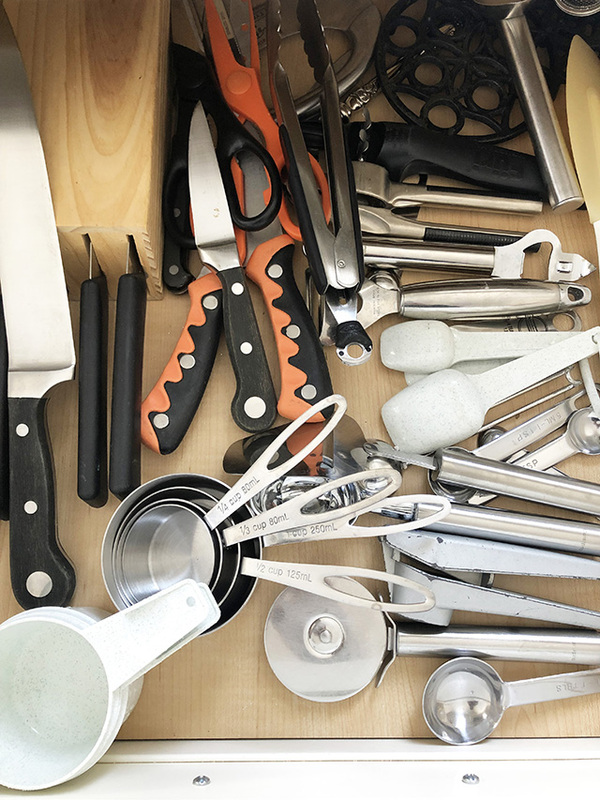 Here’s a peek into the drawer to the immediate left of the stove. It’s a whole lot of what-the-heck-is-even-in-here?? Seriously, I know for a fact that I can get rid of more than half of it. After nine years, I still have a ‘temporary’ storage solution – that turquoise box that houses who knows what. Tupperware containers full of cookie cutters, salt and pepper shakers that are years old – so old, I don’t even know how old! Yikes! This is where it really starts to get embarrassing. The drawer to the immediate right of the stove is in rough shape! Here we keep our knives, measuring cups and spoons, small utensils and whatnot. I don’t even have a proper set of knives to cook with! That’s bad, I know…I usually use the same large one you see there on the left, and it gets tossed in with the rest of the jumbled mess. Don’t even get me started on the hideous black and orange knives and scissors. I think we got them for free, maybe 20 years ago, and that’s no exaggeration. My point is, it’s time to get rid of what I don’t use or need, and eventually invest in good quality items that function. I like easy and I like inexpensive, so I headed to the dollar store to see what I could find to get these drawers tamed, to a certain degree. At least enough so that I’m not hyperventilating when I open them – ask my family how often I them our drawers give me anxiety haha. 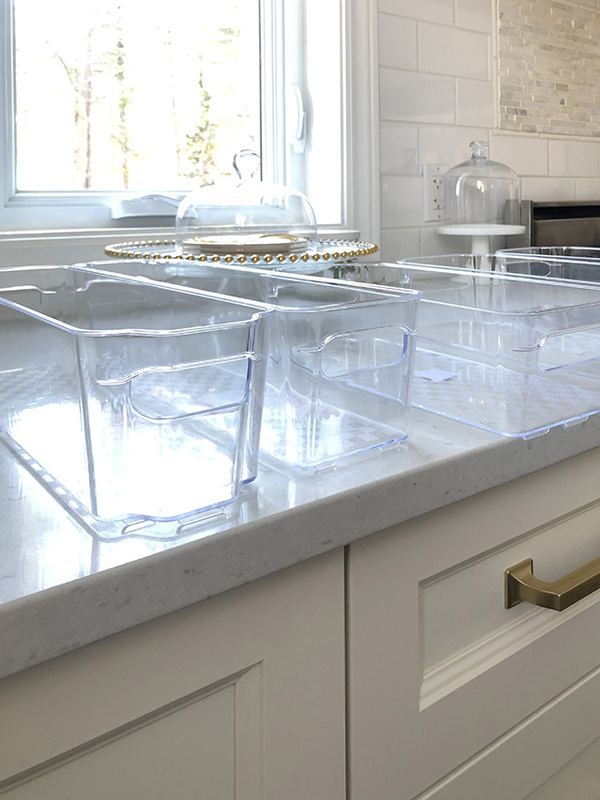 I found these very basic, clear plastic bins that are sure to whip these drawers into shape in no time at all. 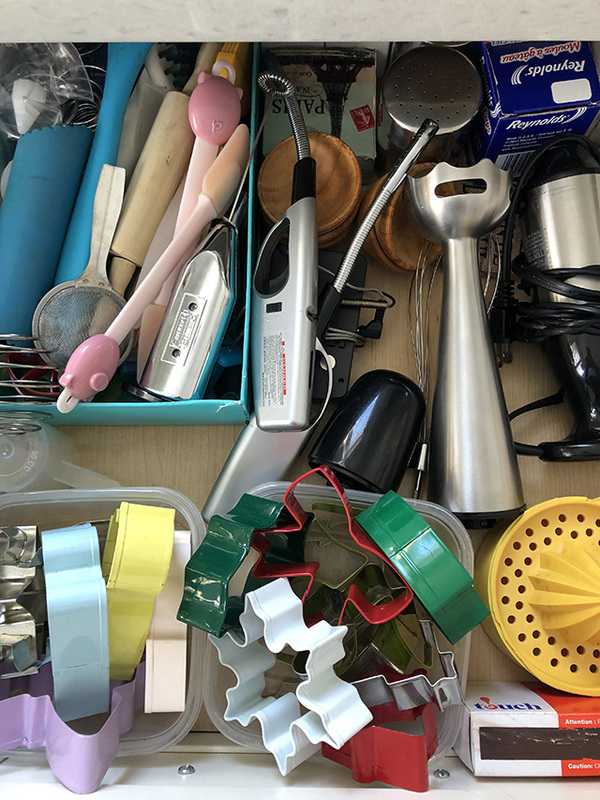 Scroll down to see how they fit in the drawer – this isn’t organized perfectly yet, but just having bins that contain the clutter already makes me breathe a little easier – did I mention clutter and mess give me anxiety?? 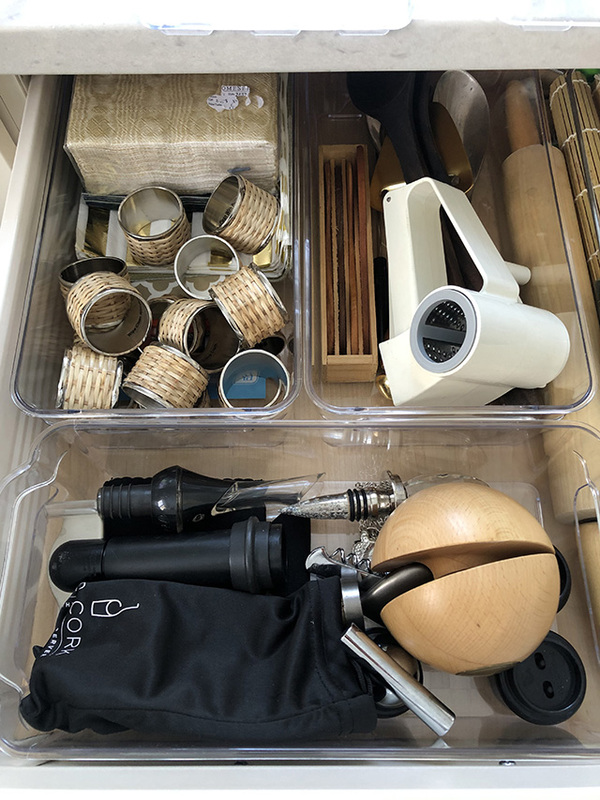 I realize that it’s not the most beautiful inside of a drawer, but simply having items contained and not sliding and rolling around everywhere really makes a huge difference. Three bins per drawer, and I’m a much happier person already. Can’t wait to purge these drawers and get them cleaned up! OUR VERY SCARY LINEN CLOSET! Here’s where things get a little more complicated and a little more expensive. Our linen closet is in rough shape and I’m very embarrassed to even open the doors. 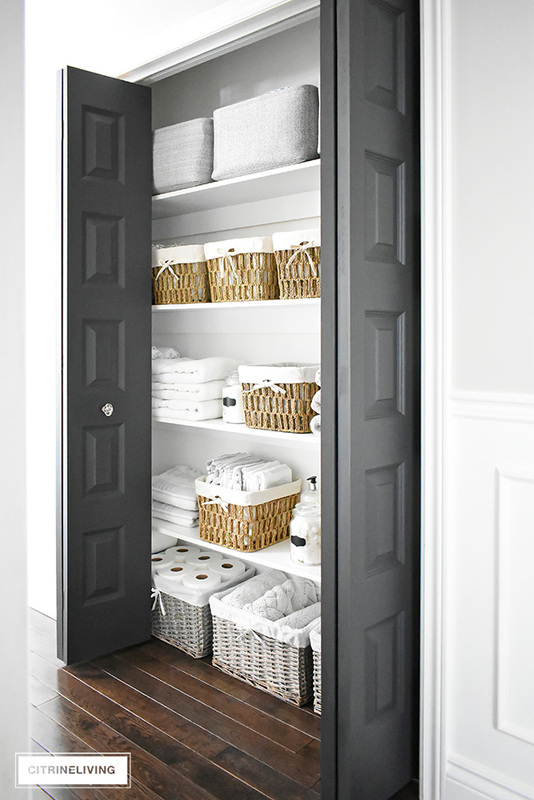 It functions as a linen closet, a medicine cabinet and also needs to house extra bathroom supplies and toiletries. Our bathrooms have very limited storage so this closet is very hard-working. Now it’s time to make it pretty because this unorganized hodgepodge has had it’s time. 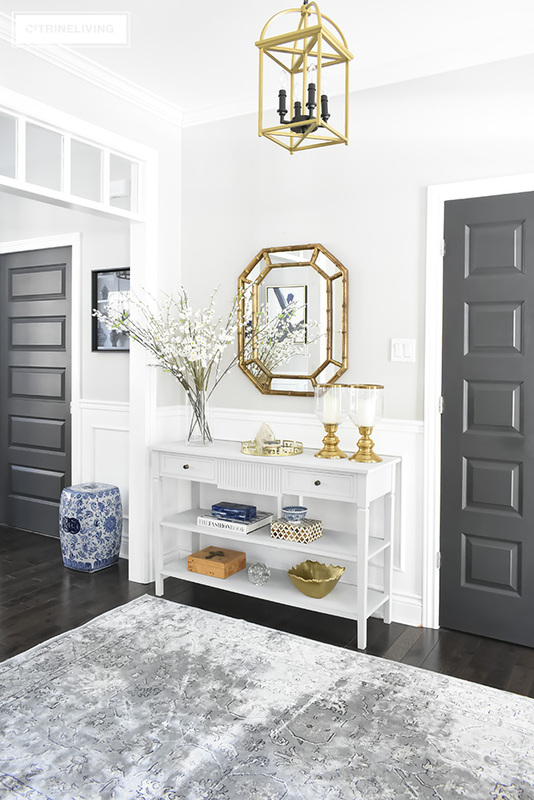 I plan to purge and declutter, paint a fresh coat of white paint, and fill it with beautiful storage bins and baskets that will make it much easier to look at and find what we need. 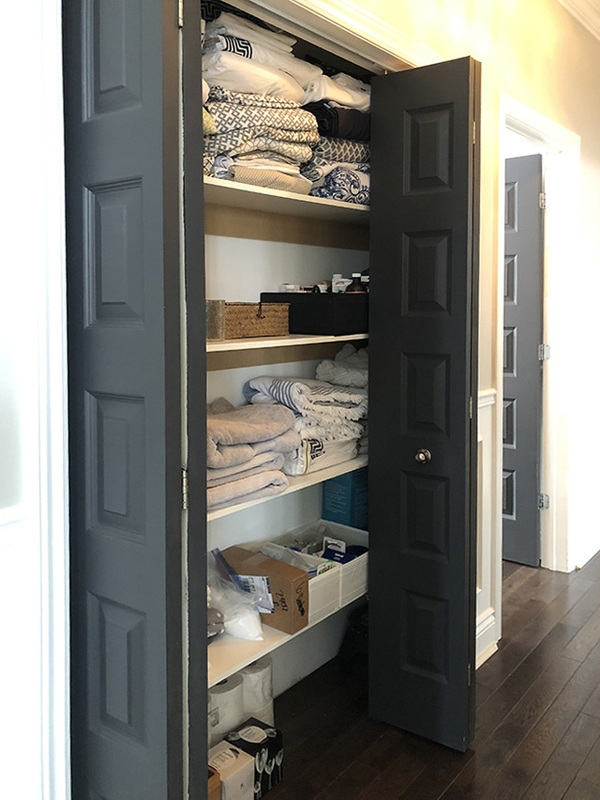 It’s a tricky closet to organize because it’s very shallow – only 11 inches, but the width makes up for it, which is about six feet. There’s plenty of storage space behind the walls on both sides of the doors, which I eventually plan to replace with regular doors – these standard bi-fold guys have to go, but that’s another project for another time. 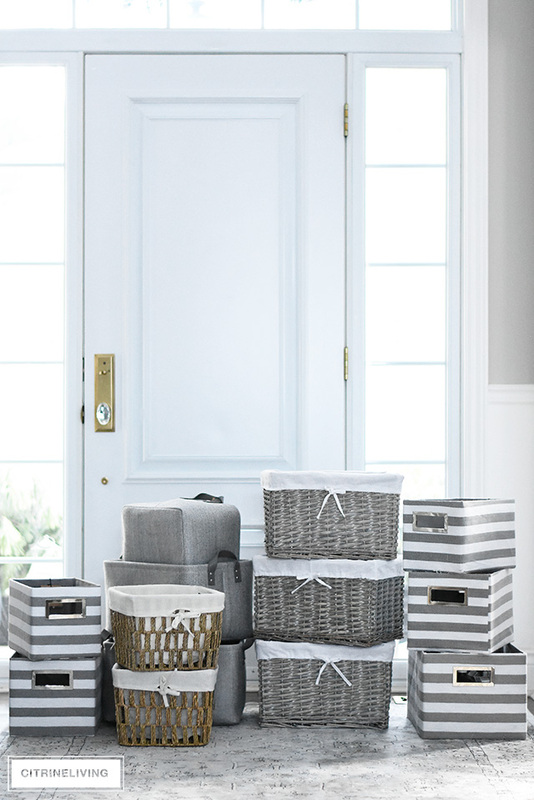 I found a mix of beautiful baskets and bins below, from Bouclair Maison, which is a local retailer. They were all 20% off, which always makes me happy! 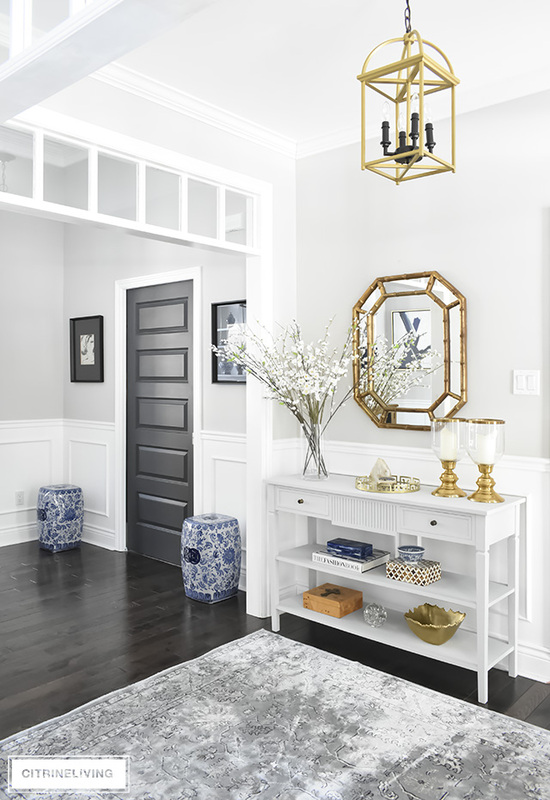 The natural woven baskets are from Walmart – you can find similar ones here and also shop different options of the grey baskets below. I’m not sure I need all of these just yet, but I’m very excited to get this project going and I’m planning on getting on it this weekend, so make sure you keep your eyes open for a reveal post next week! I’m excited just thinking of the final product. The next two spaces I plan to get on top of, are our spice cupboard and bill cupboard. Like I mentioned, we don’t have a ton of storage in our home, so it really needs to be efficient. 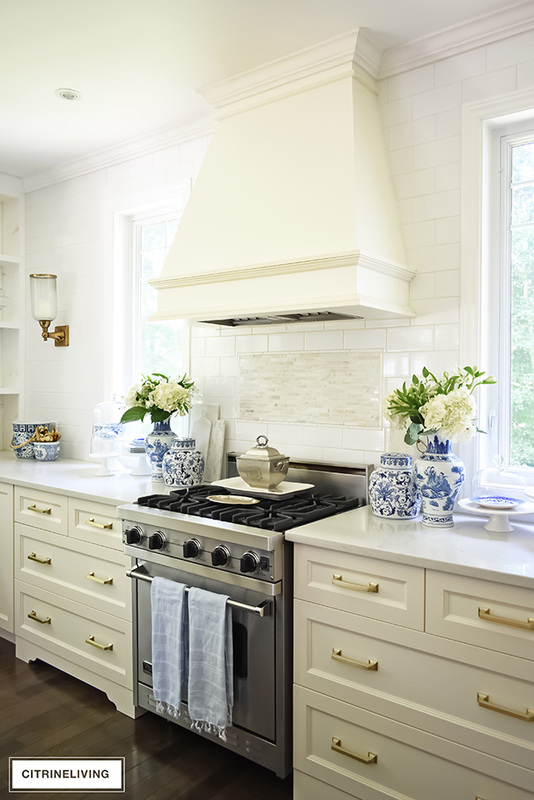 Here’s a rare peek at this corner of our kitchen. This cupboard needs a little purging and some pretty and functional containers to make it operate more optimally. It’s not the prettiest to look at, but it’s not the worst either, so I’ve been putting this one off for a very long time. Stay tuned for an update hopefully soon! Lastly, our tiny little ‘home office’ of sorts is doing alright – it’s not pretty, by any means, but we did recently declutter and purge some old bills and sorted and filed important papers (by the way, I still have years-old piles of bills waiting to be shredded in the basement…I think that is a project I really need to get on soon!). 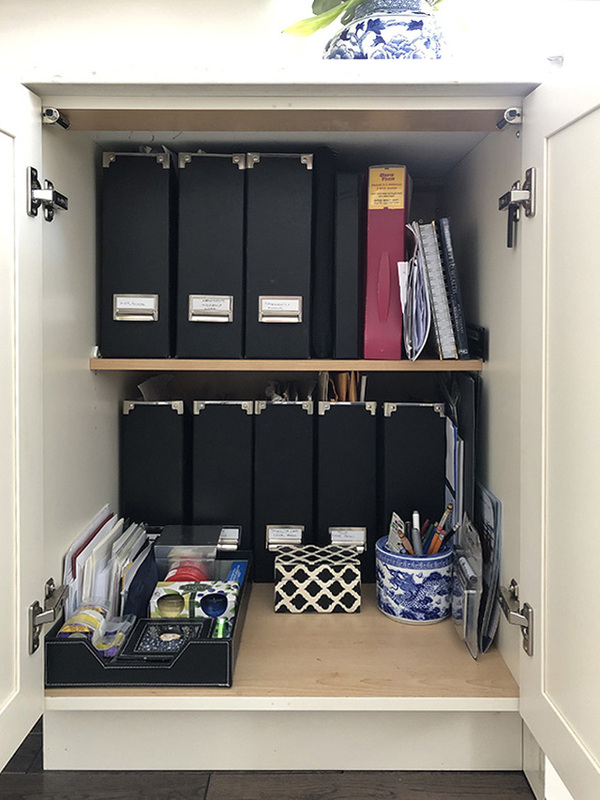 It’s kind of junky looking right now, so I do plan to find a pretty tray and maybe some new magazine storage boxes – which are perfect for papers when you don’t have a filing system. Or, I may just keep these ones, I haven’t decided yet. It just needs cleaning out and prettying up until I can carve out a real office space in our home. 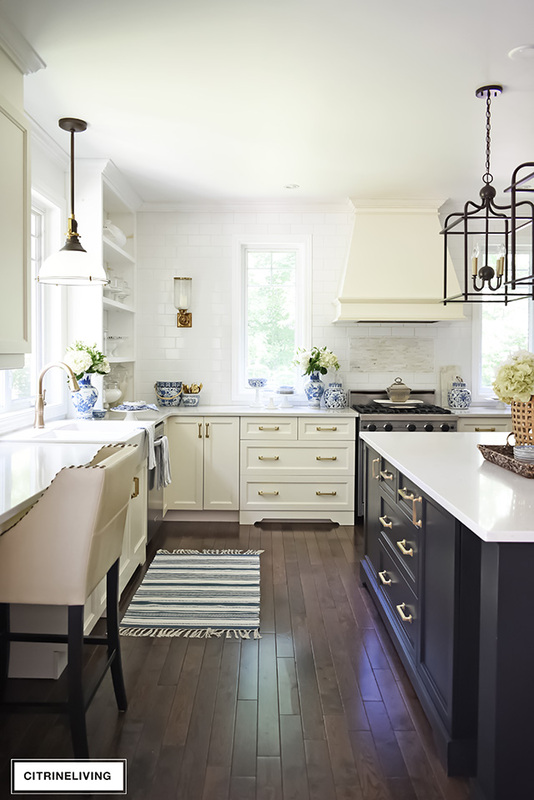 « BEHIND THE SCENES OF MY BETTER HOMES & GARDENS PHOTOSHOOT! This is absolutely AMAZING!!! You are AMAZING!!! and so inspiring. As soon as i leave work today, i am going to tackle my pantry. Thanks so much! For your napkin rings: go to Bed, Bath, and Beyond and buy their pant hangars that can be used for like 5 pants. The individual hangars come out so you can slide the pants on. I put my napkin rings on each one. I can get several sets on each pant slide. Then, you hang them and get them out of drawers. it works GREAT. Oh that is such a brilliant solution! Thank you for the tip! !